Arsenal star Jack Wilshere has moved to calm a storm surrounding his leading of foul-mouthed chants by apologizing for his actions. Arsenal midfielder Jack Wilshere has issued an apology for leading a foul-mouthed chant aimed at the club's rival, Tottenham, in the FA Cup holder's victory celebrations. England international Wilshere played his part in Arsenal's record 12th success in football's oldest club competition as the Gunners beat Aston Villa 4-0 at Wembley on Saturday. 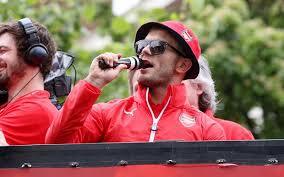 Wilshere subsequently grabbed the microphone as Arsenal players toured London in an open-top bus on Sunday, asking the adoring fans over the public address system: "What do you we think of Tottenham?" The supporters responded with "s***", before Wilshere asked: "What do we think of s***?" Wilshere's actions were met with criticism in some quarters, and the midfielder has taken to Twitter to show some contrition. "Sharing back to back cup wins with so many amazing Gooners is a dream come true," he wrote. "Apologies if I upset or offended any of you with my celebrations."